A bright colourful salad, perfect for sharing. Blister the peppers by holding them over the naked flame of a gas ring. Carefully turn every now and then until the skin is charred. Leave to cool in a covered bowl for 20 minutes. Put a sieve over the bowl and open the peppers over it, to reserve the sweet juices. Remove all the skin and seeds, then tear the flesh thinly, lengthways. Add the pieces to the juice with the garlic, vinegar and oil. Season and leave to one side. Cut the gems lengthways into 6 intact pieces. Place them in a large bowl and squeeze over the lemon juice. Grind over a little black pepper and mix gently. 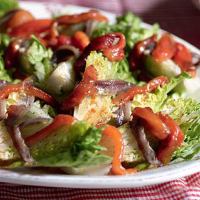 Arrange the pieces on a large flat plate; drape an anchovy fillet and the prepared peppers over each. Serve immediately.